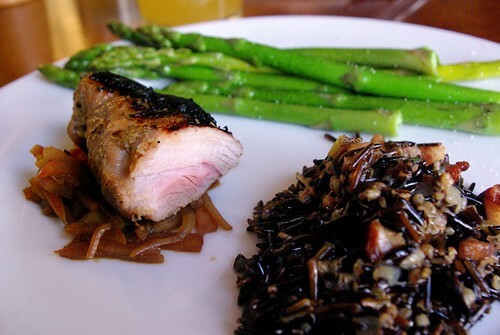 slow cooked country style ribs over a savory slightly-deconstructed applesauce/chutney with bacon wild rice and poached asparagus, originally uploaded by aarn! +21st April, 2009+. started a braising stock from pureed onion, garlic, shallots, and celery. lightly simmered the pureed mash in 2T. of butter, deglazed with a little sherry and added 1.5c. of water, 3T. of dark brown sugar and a lot of hand ground spices (dried mace, marjoram, caraway seed, a dried tobasco pepper, celery seed, salt and pepper). simmered the liquid for a few minutes then let cool and poured over 1.5lbs of coutry style ribs from stillmans farm, in a deep casserole dish, and let cook, covered, in a 175-degree oven for over two hours. the internal temperature was around 140-degrees when the ribs were pulled and then transferred to a hot grill for some color and texture. thinly sliced 1/3 of a large yellow spanish onion and placed it in a sauce pan with 2/3 of a braeburn apple which had been julienned into matchsticks, and 1T. of butter. let the apples and onion soften and brown a little, then deglazed with a splash of whiskey and added 1T. of molasses and 1T. of worcestershire sauce, salt and pepper. let this cook down until all of the liquid had been absorbed/evaporated and there was a nice light syrup coating the apples and onion, then removed from heat and covered until ready to use. browned some large chunks of farm bacon (3/8-inch cubes), removing as much of the drippings as possible, then added some diced yellow spanish onion and diced celery ribs, and lightly simmered until the onions were tender (with a little salt and pepper). added 1c. of wild rice and let that crack over the heat and absorb the remaining bacon grease until the wild rice was a little toasted, then added 3c. of boiling water and cooked for 35-minutes. mixed in some paprika, bay leaf, cayenne pepper, and soy sauce, and a splash of seasoned rice vinegar, just before serving. the ribs were served over the warm applesauce/chutney with some of the wild rice and some asparagus poached with a little butter. It's hard to look at your blog as it always makes me so damn hungry.